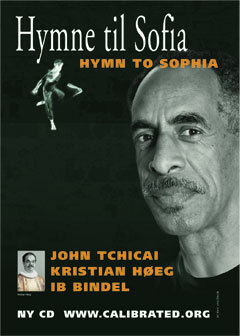 Jazz icon John Tchicai (composer) and lutheran pastor Kristian Høeg (text and idea) are breaking new grounds with the cantata ”Hymn to Sophia”. Joyfully rather than austere the music is exploring the spiritual domain for a postmodern age. Inspired by the Biblical notion of God's Wisdom, Sophia, Tchicai*has weaved a solid fabric of various musical textures: Eastern Orthodox and early Western church music, improvisation, Danish hymns. Transcending barriers of style and tradition a rich blend of materials is presented in a unified vision of new sacred music. The score for ”Hymn to Sophia” was commissioned by The Danish State Art Foundation and written for four classically trained solo singers, a mixed adult choir, a young girls' choir, two marimbas, drum set, contrabass, two violins, bass clarinet dub. sopraninosax, alto clarinet dub. sopranosax. The choreographer and dancer Anna Maija Rolff-Petersen was involved in the preparation for the first performances of ”Hymn to Sophia” in several full churches in Copenhagen in 2001, and a ”live” recording and video-documentary was made. An enhanced CD has been produced with an additional 21 minutes CD-ROM track which highlights the performance in the Church of Messiah, Charlottenlund, Denmark. Five pieces of improvisations led by John Tchicai concludes the CD. 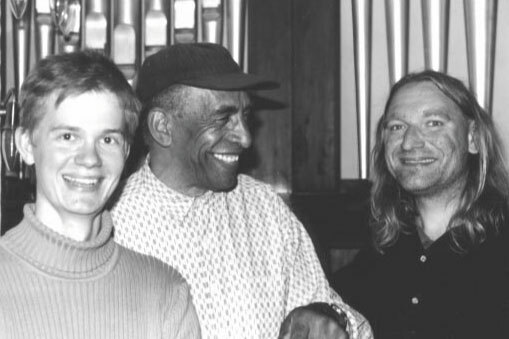 This time Tchicai is stretching out in the church on tenor saxophone with Peter Ole Jørgensen on percussion and the young composer Frederik Magle aptly using the unsuspected potential of an electro-pneumatic church organ. This is another example of the evolving Danish new sacred music, which makes for a fascinating comparison with the cantata. The CD ”Hymn to Sophia” has been warmly recommended by Rector Peter Danstrup, Rythmic Music Conservatory, and Rector Steen Pade, The Royal Danish Academy of Music. The five last tracks on this CD, published under the title MUSICA SACRA NOVA, was recorded at a jam session with John Tchicai, Peter Ole Jørgensen and myself, in one intense and inspiring late afternoon. It was a wonderful experience playing together with such outstanding musicians and working with a different genre from the contemporary classical which is my background. The result was five very individual improvisations on compositions by John Tschicai, in a genre that can best be described as a fusion of avantgarde jazz, avantgarde classical, and then a lot more. One of the exciting aspects of this project is the fact that it actually cannot be classified. The music speaks its own free and unrestrained language, and the improvisation form allows for interesting and alternative experiments of a playful nature. (Something that was also expressed in the imaginative and exotic arsenal of percussion used by Peter Ole Jørgensen during the recording session). However, several of the tracks are contemplative and serious in their nature, but that does not in any way contradict the playfulness of the improvisation. On the contrary, playfulness and pensiveness does not exclude eachother. In fact both qualities may be strengthened when combined in music. Another alternative apsect of this recording is the use of the pipe organ together with saxophone and percussion in a genre different from the "classical" organ music. In this case; avantgarde jazz. Actually it is not unnatural to the instrument at all: the pipe organ has no limits when it comes to musical genre. Any instrument has strenghths and weaknesses which represents its natural boundaries. However, within the boundaries of the pipe organ, room can be found for a surprisingly broad variety of musical genre, including classical music, jazz, rock, and much more! I have no doubt that these exciting possibilites will continue to be explored even further in the future.